The morning sessions at the 24th JSS Annual Music Conference were both educative and entertaining. On 3rd December morning, Mysore V. Subramanya gave a lecture-demonstration on ‘The Glory of Jhanjuti.’ He described how the name came into existence. Pinakapani named it jhanjuti. ‘Raganidhi’ describes it as jinjuti. It is also known by the name jhanjuruti and senchuruti, meaning abundant, ample and prosperousness. The name also indicates the meaning of ‘Shiva’. The raga is known to be 200-250 years old. It is a Nishaadantya raga meaning the raga can be developed only up to ‘d’ or ‘ni’ in Madhyasthayi. ‘Sangeeta Sampradaya Pradarshini’ mentions it as the janya of Kedara Gowla. Like Kambhoji, Jhanjuti has ‘snpd’ sanchara. Sung in madhyama shruti, the raga is known to depict veera and shringara rasa. Normally this is sung/played in pure notes with less of gamaka. There are about 15 compositions in this raga. Jhanjuti has appeared in Hindustani music in the 18th century. Usually labelled as a light raga, it is sung in the form of a devaranama or tillana towards the end of the concert. Being the great grandson of Veene Seshanna, Subramanya had chosen many compositions of his great grand father for the morning. Sheshanna’s well-known swarajati was demonstrated on veena by Geeta Ramanand. The last two stanzas of the swarajati, normally abandoned by the teachers perhaps due to its complication were played by Geeta. ‘Gange maam paahi’ by Deekshitar, Swati Tirunal’s ‘Kalaye Shree kamala nayana charane’, a devaranama of Veene Sheshanna ‘Sakhi Prana’ and the popular tillana ‘Dhirana tanadheem tadhirana’ were also played by her. Vikram Bharadwaj provided mridanga accompaniment. Mysore T. Chowdiah’s popular ‘Maha Tripura Sundari’ deserved at least mention. The highlight of this programme was the rendition of theatre songs by the 87-years-old Paramashivan. 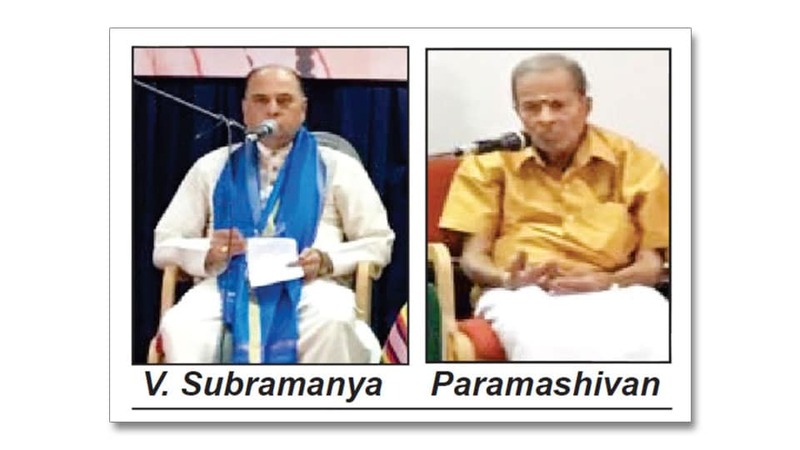 Paramashivan chose two songs — one from ‘Sangeeta Subhadra,’ wherein Krishna sings the song ‘PeLele manada vicharava RANi’ to Subhadra and the other from ‘Kaviratna kaLidasa’ in Mishra Chapu – ‘Induvanajite.’ The energy of the octogenarian was widely appreciated by the audience. The second was an interesting paper on the topic ‘Formal Grammars for Music Composition and Theory Analysis’ by Daniel Miller. Sharat Rao from Mysuru assisted him with the paper. Miller demonstrated automatic accompaniment for songs on computers. He also demonstrated how a small piece of money can be used as a speaker on a violin and showed how computers can speak back to the instrument. The best part of this lecture was the demonstration of how computers can be used to identify swaras which is a struggle for the beginners. Daniel has invented a software to identify the swaras, which is very useful for the beginners. Gamakas were also demonstrated visually on the screen during the presentation. Dr. R.N. 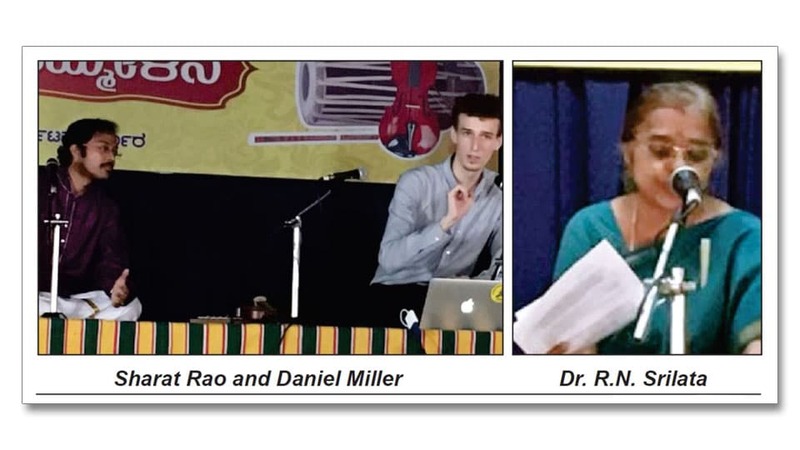 Srilata presented a paper on ‘Vivadi ragas’ of Tyagaraja and Deekshitar. When a raga has a special swara as the vadi (controversy) swara, it is called a VivAdi raga. For example, the ‘g’ in varALi. The very existence of the 72 melakarta ragas is due to Vivadi swaras. About 40 of the 72 ragas are vivAdi ragas. Srilata took up several ragas in both asampurna mela system and sampurna mela system hand in hand and sang several compositions of Tyagaraja and Deekshitar to show the difference in sancharas of the respective ragas. Kanakambari-kanakangi, Ganamurty-ganasamavarALi, Vanaspati-Bhanumati, Mararanjani-Sharadyuti, Gangeyabhushani-Gangatarangini, Vagadheeshwari-Bhoga chaya nata were analysed with the compositions of Deekshitar and Tyagaraja. The paper required a lot of homework. The senior musician’s analysis was commendable.